We have long felt that visual materials, as accurately attested and attributed as possible, should be made accessible to scholars and those wishing to make documentary films. We knew that it would be no trivial task to undertake the work of attesting and attributing photographs, but the difficulty has far exceeded our initial expectations. It inevitably takes a great deal of time and more than a little luck. And, one has always to be on the look-out for connections. The famous French bacteriologist Louis Pasteur (1822-1895) said something to the effect many years ago that good things come only to the prepared mind. Sounds good but preparing the mind is not easy either. Arbitrarily but also trying to be realistic, upon our retirement we decided to concentrate in earnest on events up to 1923. Again, by design and for obvious reasons, we focused on the earlier years rather than the later ones. And for personal reasons, we have further concentrated our efforts on the events in the Kharpert region. A recurrent theme signifying the onset of the Armenian Genocide is the beheading, figuratively and literally in some cases, of the Armenians in the broadest sense, by first targeting intellectuals and intelligentsia, the community leaders at every level. This effectively eliminated any potential for significant resistance. Around the same time we published an essay entitled “Achieving ever-greater precision in attestation and attribution of genocide photographs” in a volume The Genocide of the Ottoman Greeks, studies in the state-sponsored campaign of extermination of the Christians of Asia Minor (1912-1922) edited by Tessa Hofmann, Matthias Bjørnlund, Vasileos Meichanetsidis (Aristide Caratzas, New York and Athens, 2011, pgs. 389-434.) We drew special attention on pg. 408 to a description by Dr. Mark H. Ward, who served in Harpoot, of a little Greek orphan boy during the deportations of the Pontic Greeks. That word picture about this little tot losing his grandmother during the exile far exceeds any photograph that we could have encountered or found. The word picture was recounted in the course of a fund-raising plea made by Dr. Ward in Boston upon his return to America after he and his colleagues were kicked out of Turkey without any explanation. Ward knew what he was talking about since he was Director of the Medical Unit, actually head of the ‘American Hospital’ in Mezreh. The heart-wrenching description of a little Greek boy on the road to exile, losing his grandmother etc., is of course totally typical of what happened to Armenians but considerably earlier than what was happening to these Greeks that Dr. Ward was talking about. Major Forrest D. Yowell, head of the Harpoot Near East Relief Unit, gave a considerably more detailed account of the situation in Harpoot and from that it is quite clear that the Turks were not at all pleased with Americans trying to help save the latest exiles and ‘refugees’ (see the May-June issue of The New Armenia (NY) 1922 vol. 14, no. 3, pgs. 39-41) . Haigazian University (previously Haigazian College) was founded in 1955 in Beirut and was named after the distinguished educator. On Wikipedia one sees mention made of Dr. Haigazian’s death according to the New York Times. 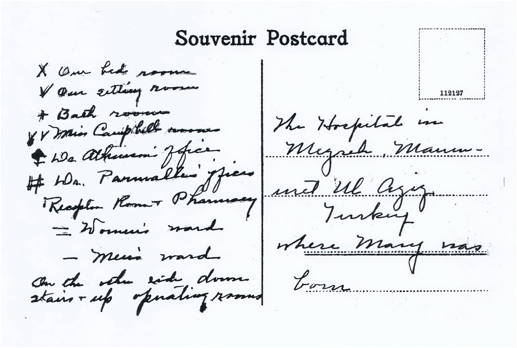 Dr. Haigazian died on July 7, 1921 at the American Hospital in Mezreh, Mamuret-ul-Aziz [Kharpert]. This is reliable information because it derives from the diary entry of Dr. Ward, who was in charge of the Hospital, and an attending physician. We won’t bother going into detail on Dr. Ward’s record-keeping of the populations of Greeks and mostly left-over Armenian remnants being moved for the most part southwards from the Pontus area, but most assuredly from other areas as well, as was the case with Dr. Haigazian from Konia (the ancient Iconium). We refer cynically to these events as ‘mopping-up operations.’ How Dr. Haigazian was able to survive the genocidal atrocities as long as he did is a moot point. He probably had connections and we also do not hesitate to venture to say that a fair amount of money probably exchanged hands as well. Altruism in those days took on many faces. Perhaps someone out there knows the story. “Ten persons arrived today by yailis [a yaili is the name in Turkish for a spring wagon] from Konia, and were admitted to the American Hospital in order that we might delouse them. 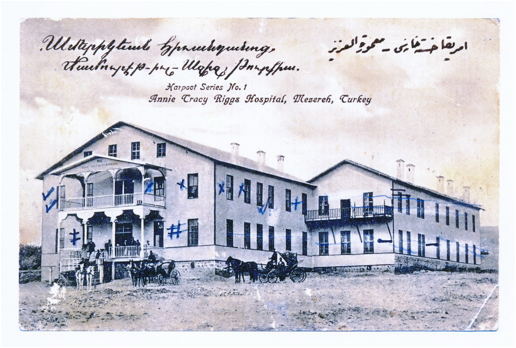 Refugees with typhus or danger of typhus are treated gingerly by the Turks, as they may spread the disease further among the Turkish population. This is a small group of high-quality people. In the group is a Greek priest, a wealthy Greek engineer, a wealthy merchant and his wife, and the well-known Professor Haigazian, president of the American College at Konia. Prof. Haigazian is a graduate of Columbia University and Union Theological Seminary, and has also received a Ph.D. from Yale. He speaks English perfectly. He appears weak and ill: we are doing all we can for him. LATER: On the 23rd the government ordered us to send Prof. Haigazian to the quarantine camp. This was very bad for him, as the men there are very lousy, and he could hardly escape being infected. On the 25th I saw him at the camp and he seemed very ill, but we were unable to get permission for him to enter the hospital (emphasis ours). There you have it from the senior physician in Harpoot/Mezreh who kept detailed notes. There are many questions that remain of course but the essentials are here. His grave is certainly one of the many now lost. Some of the facts in the New York Times are wrong, and one can trace them in part to Dr. Ward, and via him to nurse Miss Wood. First of all, Armenag Haigazian was not a graduate of Columbia University or of Union Theological Seminary. Clearly some confusion crept into the picture – either on Dr. Ward’s part or even Dr. Haigazian’s since he was ill with fever etc. “I was born in 1871 at Hadjin, Asia Minor; graduated from Hadjin High School in 1885; graduated from Central Turkey College at Aintab, in 1889; a tutor in mathematics during my junior and senior years in the same institution. 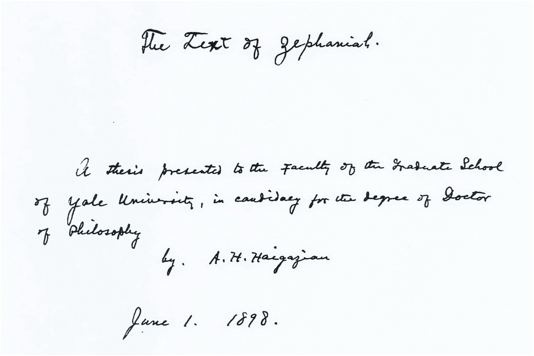 The degree of Doctor of Philosophy was conferred on Armenag Harutune Haigazian in New Haven in June 1898. His thesis was entitled “The Text of Zephaniah.” One can ‘Google’ to one’s heart’s content learning today’s relevance of this Old Testament prophet. We admit never having heard of this prophet. Dr. Haigazian seems not to have published much but he wrote a very scholarly review of Fred. C. Conybeare’s The Key of Truth. A manual of the Paulician Church of Armenia. Text edited and transliterated with Illustrative Documents and Introduction. (1898) Clarendon Press: Oxford for The American Journal of Theology vol. 3, no. 2, pgs. 380-384. He was a member of the American Oriental Society. Below we present some rare photographs to help achieve a mise en scène, or put into the scene as it were, in this case a very sad scene, to some extent at least, the place of the death and the appearance of some of the caregivers and individuals Dr. Haigazian necessarily encountered. Whether he was in any condition to acknowledge any of these people, or was simply too sick to do so we shall never know. They are, however, part of his final days. 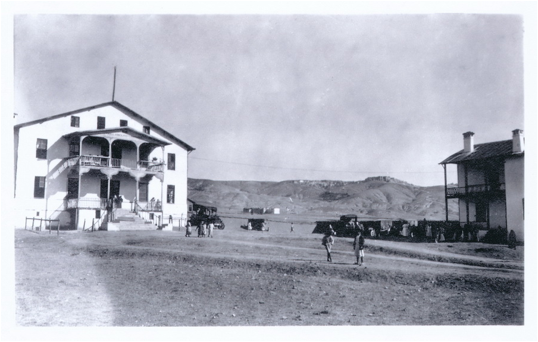 The American Hospital: The “American Hospital” was dedicated on 9 October 1910 as the “Annie Tracy Riggs Hospital”. The hospital was named for the late Annie Tracy Riggs, the first wife of Rev. Henry H. Riggs. The post card image is fairly well-known. What is much less well-known is the layout of the facility. The front and back of the Annie Tracy Riggs Hospital card are followed by a view in 1919 of the Hospital yard and adjacent house in which Mrs. Tacy Atkinson, widowed since the end of 1915, resided with her children. One can see in the distance Harpoot city up on ‘the mountain’. Two views of the Hospital follow. The first shows the outside wall to the Hospital compound. The other one shows the layout inside the walls. 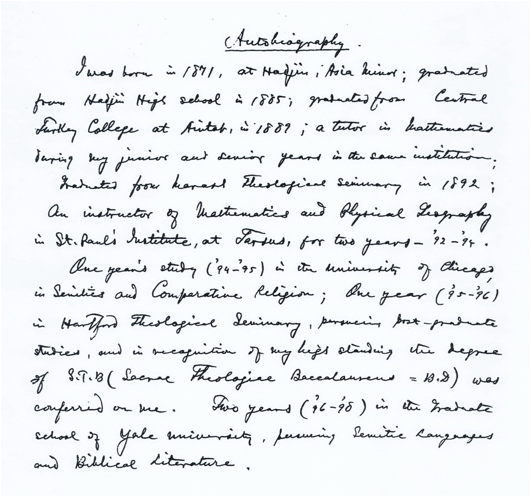 Both derive from photographs by Frances C. MacDaniels and Dr. Laurence H. MacDaniels, many of which are now at Oberlin College Archives. Husband and wife MacDaniels served in Harpoot with the American Committee for Relief in the Near East, ACRNE. We feel it will also be both useful and interesting to provide photographs that show what Drs. Ward and Parmelee looked like in 1919 when they served in Harpoot for Near East Relief. It would have been nice to have something a bit later but no matter. We shall do with what we have. The first is a crop from a considerably larger photograph of the relief worker staff at Harpoot Station, taken in October, 1919. This is close enough we feel to the time of Dr. Haigazian’s death. 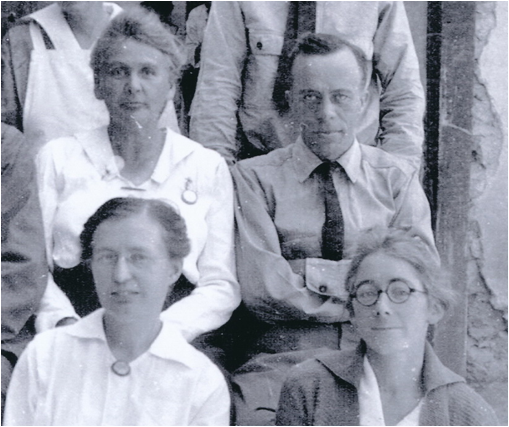 Dr. Ward is on the upper right; to his right, incidentally is Mary W. Riggs, well-known for her many years service at Harpoot, and sister to Henry H. Riggs and Ernest W. Riggs. On the lower left we see Dr. Ruth A. Parmelee. On the lower right is Mark Ward’s wife, Mrs. Anna Rathburn Ward. We thank Mrs. Ellen M. Speers for permission to use this photograph from her parents’ collection. Another photograph, taken inside, and cropped to allow only Drs. 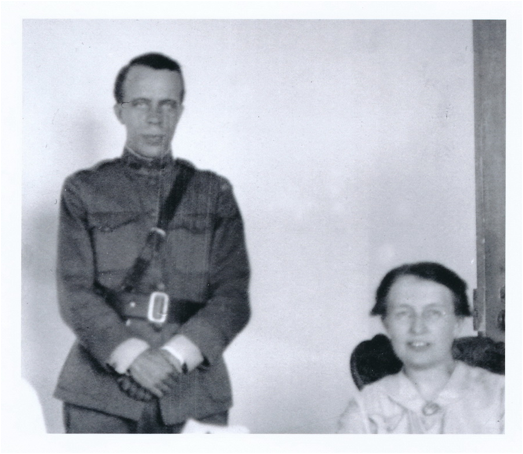 Ward and Parmelee to be seen, shows Dr. Ward on the left in uniform and Dr. Parmelee, seated on the right, at Mezreh in 1919/1920. Again, this comes from the MacDaniels’ collection. We hope that this brief accounting has provided some lesser known details of Dr. Haigazian’s death, and the environment, in a rather general way at least, and the context in which that tragedy occurred. He was only about 50 years old. Photographs of a few of those who provided care in an attempt to save him after every effort had been made by the Turkish authorities to make sure that he did not, in fact, have the care he required. They even had the audacity, perhaps we should not use the word audacity since it was common practice to extort, squeeze every last drop of money out of the Armenians whenever they could, even when they feigned sympathy as in the instance of allowing him to stay on while the others in his group were sent on. He bought ‘permission’ to stay even though ‘they’ must have known it was too late. ‘They’ certainly couldn’t care less. We won’t bother about the ‘theys’ that were in charge. Perhaps Dr. Haigazian’s death might have been avoided had the authorities allowed him to be taken into the Hospital as soon as he showed up on the scene. Given the details of the situation, we feel totally justified in labeling their behavior as a deliberate act of murder. We have written a bit on Dr. Parmelee before, but not much on Dr. Ward specifically. The quotes in question are also published in considerably fuller presentation in the now very rare booklet given in Endnote 1 entitled “The Deportations in Asia Minor…” on pgs. 6-15. We did not know that the Extracts from the Diary of Dr. Mark H. Ward, Mezereh, Vilayet of Mamuret-ul-Aziz, Anatolia (showing total number of deportees observed May 26, 1921 – February 23, 1922) existed in printed form when we first came across the typed pages at Hoover Archives. We could have saved the difficult task of typing it but doing so allowed, in our opinion, for added accuracy. We have yet another copy of the typewritten pages from a different private source. It seems that more than a few copies are ‘out there.’ But we prefer to cite the Hoover Archives since they can make the pages available to anyone whereas the others are far more difficult to locate. New York Public Library does have a printed copy of the London booklet. As an aside, it is a bit of fate that one of us (ADK) while still a graduate student at Cornell University, around 1960 at the latest, was approached by Dr. M.G. Sevag, a biochemist on the faculty of University of Pennsylvania to see if he would be interested in being considered for taking on a teaching position at Haigazian College. ADK declined stating that he had just started graduate school and felt that he was in no position to take on such a responsibility. Earning a Ph.D. was the first priority. God only knows what might have transpired had he agreed to be considered. Edith L. Wood, of Quaker lineage, was a 1910 graduate of Philadelphia’s Protestant Episcopal Hospital School of Nursing and was employed since her graduation as head surgical nurse in that hospital. She saw service in Germany in 1915 before entering service with the Near East Relief, first at Marsovan, then at Harpoot and Malatia from 1920 to 1922. Near East Relief Photo Album, 1919-1910 at http://www.oberlin.edu/archive/NearEast.html. We worked for longer than we care to admit working up those photos preserved at the Oberlin College Archives. We acknowledge our debt to the late Miss Mary Masterson of Carrollton, Kentucky for having given us materials from her mother’s collections. We are grateful to Mrs. Ellen MacDaniels Speers for her continuous support and help in all our efforts involving the work and service of her parents in Turkey and especially at Harpoot. We thank the Columbia University Archives for reporting that there is no record of Armenag Haigazian having attended or graduated from either Columbia or Union Theological Seminary. We again thank Hoover Institution Archives for giving us access to the Ward material, and to the New York Public Library for making available a pdf of the Dr. Ward pamphlet.